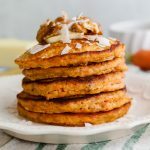 These Carrot Cake Pancakes are a delicious and fun breakfast version of the classic cake that you love! 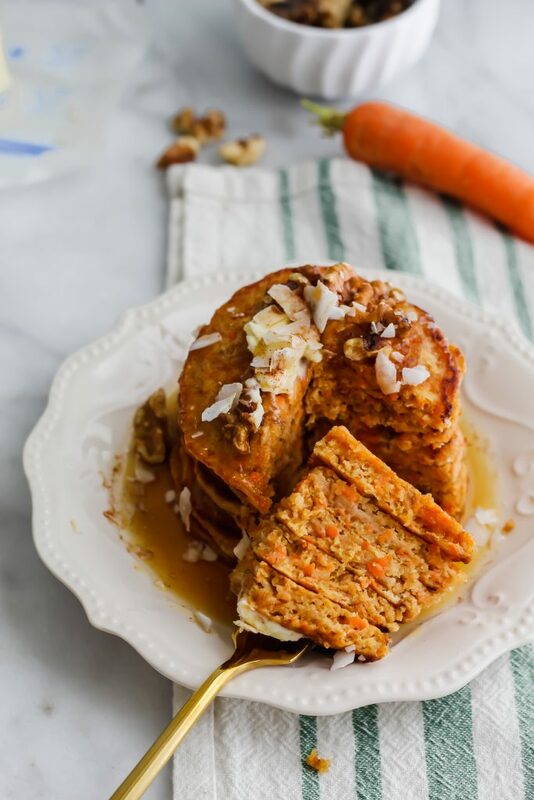 Loaded with freshly grated carrots, walnuts, carrot cake spices and topped with maple syrup. Say hello to your new favorite breakfast! It’s no secret here on Our Balanced Bowl that I have a serious sweet tooth. I mean, from the to the Fudgy Brownie Cookies, Chai Snickerdoodles and of course, Oreo Truffles. In fact, most days I have to scale back all of the dessert recipe ideas I have as to not make my blog a full on dessert extravaganza. 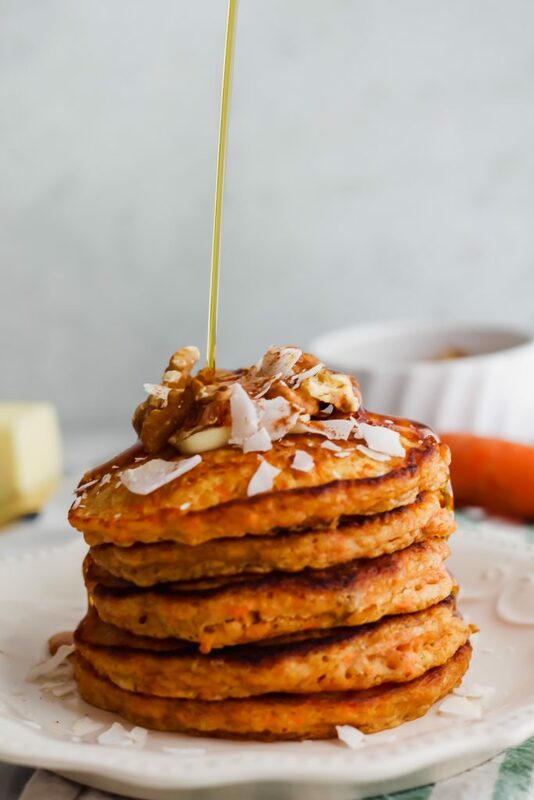 But speaaaaaking of breakfast and carrot cake, let’s talk these Carrot Cake Pancakes! Oh em gee you guys. They’re wonderful. They’re fluffy and not overly sweet. When you fry these in butter, they get the best crispy outside ring and the most delicious moist and fluffy insides. I love all of the cozy spices inside like cinnamon, nutmeg and ginger. 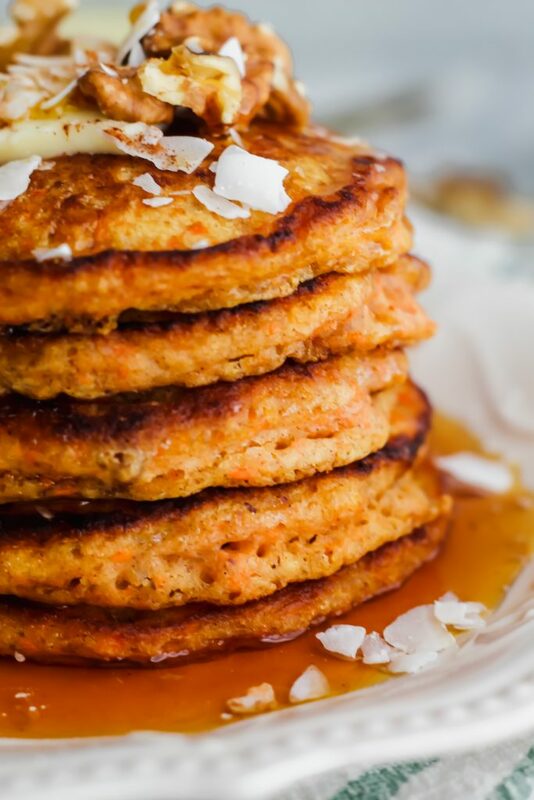 It really makes these pancakes wonderfully spicy. 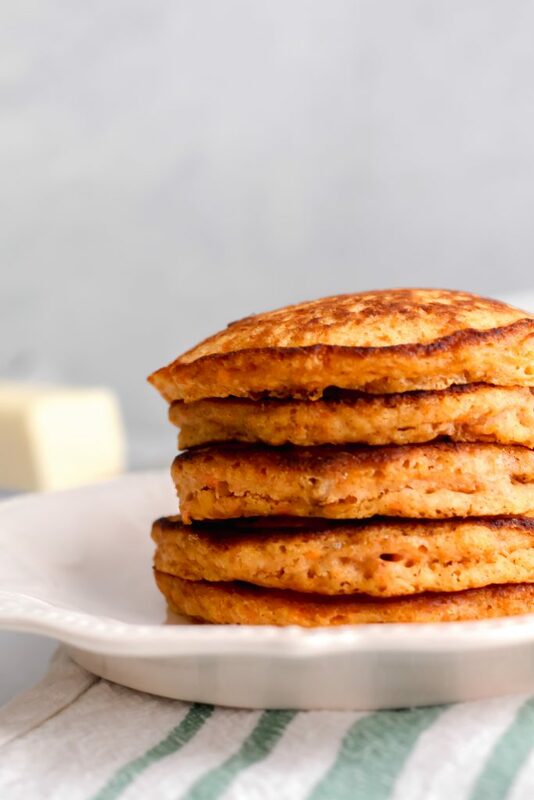 The freshly grated carrot not only gives these pancakes their wonderful orange color – but they also yield a certain texture and sweetness. 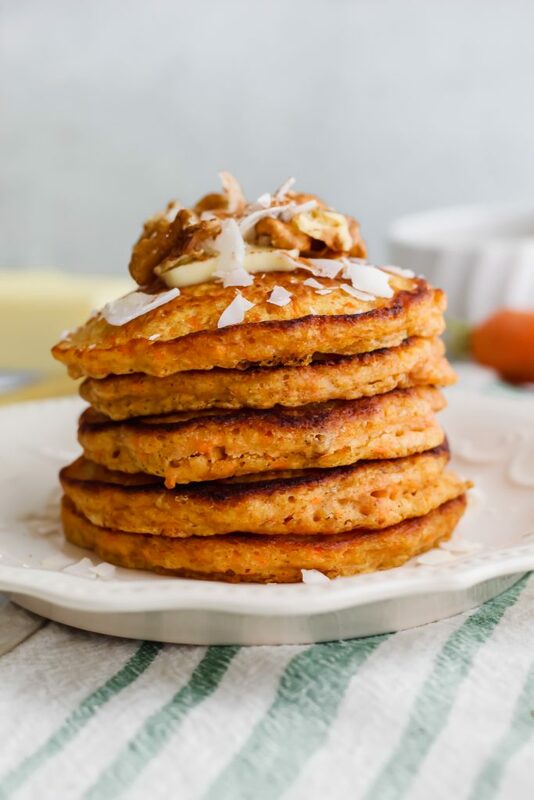 However, if you don’t like nuts/carrots or anything similar in your pancakes – these might not be for you. You can definitely taste the chopped walnuts and the finely grated carrot and I LOVED that. It embodies my perfect carrot cake – loaded with allll the goods! It’s not like, crazy hard to make once you have the ingredients BUT just in case, here’s a step by step run down. Once they’re grated, if you used the food processor – go ahead and add in the egg, vanilla extract, and whole milk to the processor and pulse for a few times until it’s all mixed together. If you used a grater, add the carrots to a large bowl with the egg, milk and vanilla extract and mix until thoroughly combined. In another large bowl, mix the dry ingredients: flour, baking powder, salt, cozy spices until combined. To the dry ingredients, add in your wet ingredients. Before mixing, add in the chopped walnuts and 2 tbsp of melted butter. Mix together until all the ingredients are combined, making sure to NOT overmix. Next, grab a non-stick skillet and add about ½ tbsp of salted butter. Melt on low/medium heat. I used a ¼ cup measuring cup to scoop my pancake batter into the pan. Let cook for 2-3 minutes on one side – until you begin to see the bubbles forming. Once you see those bubbles, flip the pancake and cook for about an additional 1 minute on the other side. It usually doesn’t take the opposite side super long to cook. Continue until the batter is fully gone! Top with more walnuts, toasted coconut flakes and of course, maple syrup! Don’t forget the coffee. And maybe a mimosa. Enjoy! Did you like this recipe? Here are a few more you might enjoy! 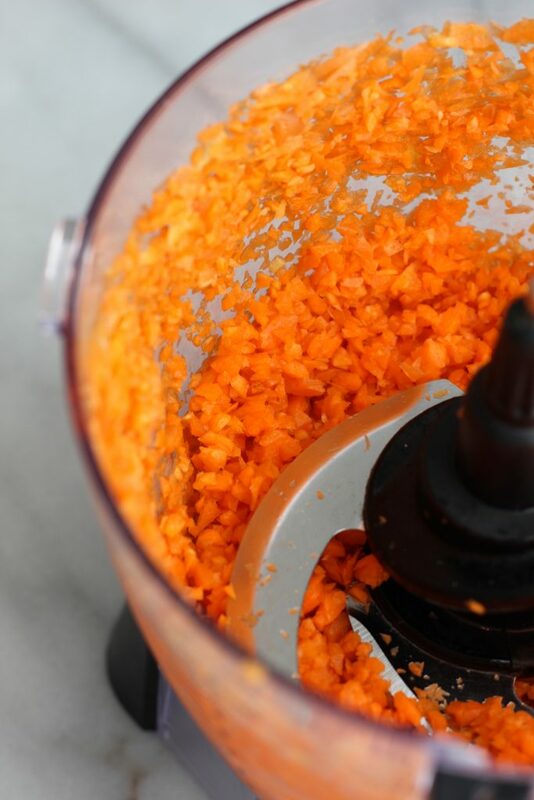 Either using a grater or a food processor, grate your carrots finely. If you're using a food processor: pulse a few times until grated finely. You can add the egg and milk and vanilla extract directly to the food processor and pulse until combined. If not using a food processor, just add the grated carrots to a large bowl with the egg, milk and vanilla extract and mix thoroughly until combined. In another bowl, mix the all purpose flour, baking powder, cinnamon, ginger, nutmeg, brown sugar and salt together. To this bowl, add in the carrot/milk mixture. Don't mix yet! Also add in the chopped walnuts and melted butter. Now, mix until all of the ingredients are combined - careful not to overmix the batter! Cook for 2-3 minutes on the first side until you start to see bubbles forming on the top. Once you see the bubbles forming, flip. Cook for an additional 1 minute or so. Place on a plate and continue to cook until the pancakes are done. I recommend adding more butter each time you add in a pancake for extra deliciousness!! 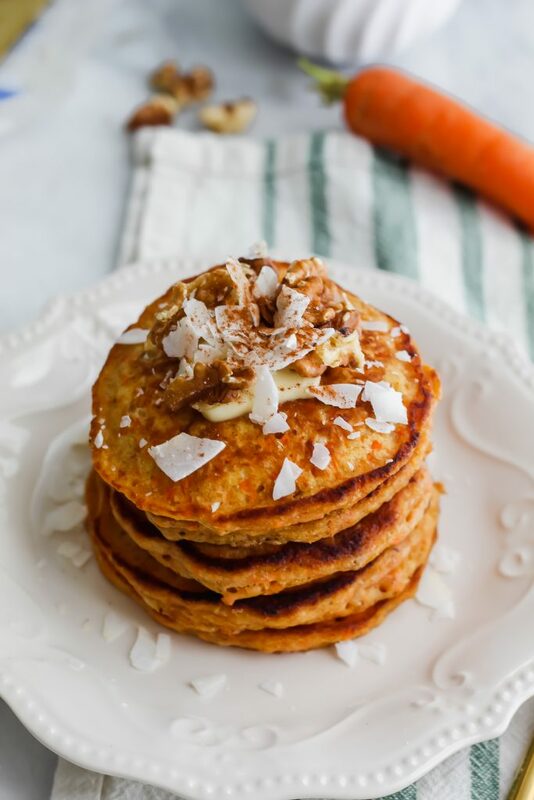 Serve warm with more butter, chopped walnuts, coconut flakes and of course, maple syrup on top! Enjoy! Thank you my sweet friend! I bet the raisins would add a delicious texture! I’m absolutely making these pancakes Haylie! Carrot cake is my all time fave dessert too, and I request a carrot cake for my birthday every year! And since my hubby doesn’t like carrot cake, I get to eat it all myself! You’re so sweet, Dawn!! They’re so good! I love carrot cake so much. And I like your thinking 😉 Extra syrup and butter for me too! I cannot wait to make these! I may add some dark chocolate chips to them, oh my goodness! !